A giant mountain on the asteroid Vesta takes center stage in this image calculated from a shape model using data from NASA's Dawn probe. The image shows a tilted view of the topography of the south polar region, where the tall mountain (at center) rises 13 miles above its surroundings. A new image from a NASA spacecraft has shone a light on a massive mountain taller than anything on Earth rising up from the south pole of the huge asteroid Vesta. The new photo, released late Monday (Oct. 10), shows the peak of Vesta's tallest mountain rising up nearly 13 miles (22 kilometers) above the rough surrounding terrain. The image was recorded by NASA's Dawn spacecraft, which is currently orbiting Vesta. The mountain is also nearly as tall as the highest mountain and volcano in the solar system, Olympus Mons on Mars, which towers 15 miles (24 kilometers) above the Martian surface. 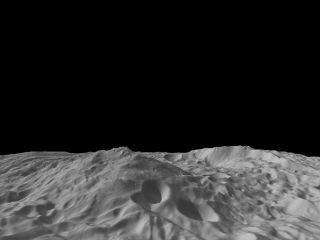 To study Vesta's tallest mountain, NASA scientists created the new image using data from a shape model of the asteroid, based on observations from the Dawn spacecraft. The resulting image shows an oblique view of Vesta's south pole region, with a resolution 300 meters per pixel and vertical scale about 1.5 times that of the horizontal one, NASA officials said. And Vesta's giant mountain isn't the only star of the new photo. "Another impressive structure is a large scarp, a cliff with a steep slope, on the right side of this image," NASA officials explained in a statement. "The scarp bounds part of the south polar depression, and the Dawn team's scientists believe features around its base are probably the result of landslides." The $466 million Dawn probe is studying Vesta —the second largest asteroid in the solar system — as part of a mission to study two giant space rocks in the asteroid belt that circles the sun between the orbits of Mars and Jupiter. Dawn arrived in orbit around Vesta in July and is expected to spend a year studying the object before moving on to the largest asteroid in the solar system, Ceres, which is also classified as a dwarf planet.